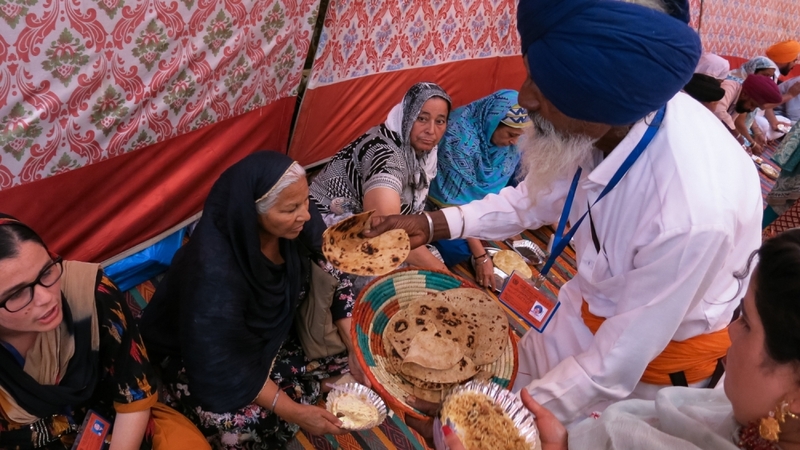 Hasanabdal, Pakistan – Hundreds of Indian Sikhs have celebrated the religious festival of Baisakhi at one of their religion’s holiest shrines in the northern Pakistani city of Hasanabdal, even as tensions between the South Asian neighbours remain at fever pitch. 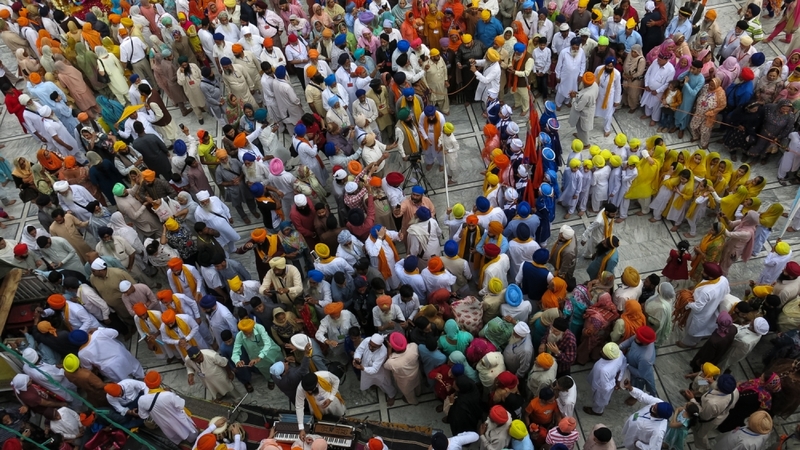 Hundreds of men and women dressed in colourful clothes lined up at the gurdwara, or shrine, to witness the reading of the final passages of the Guru Granth Sahib, Sikhism’s holy book, which is considered by Sikhs to be a living saint. The Indian pilgrims arrived in the country by foot at the Wagah-Attari border between India and Pakistan on April 12, senior civil official Imran Gondal told Al Jazeera, and will stay in the country until April 21, completing pilgrimages to a number of other holy sites. 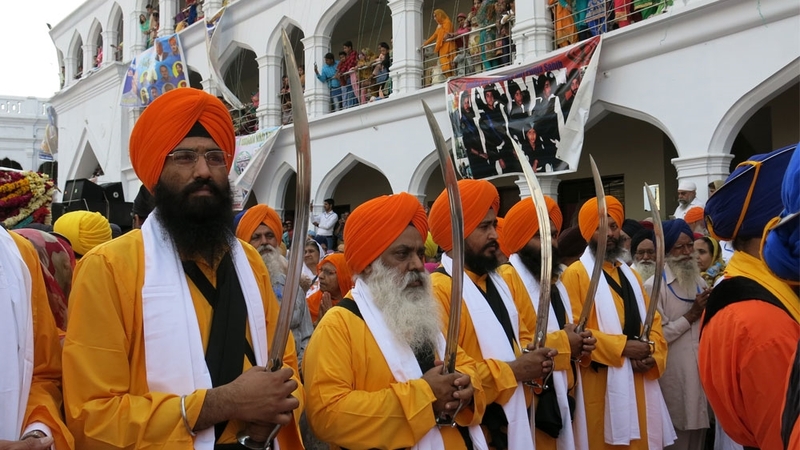 Sikhism, founded in the 16th century by Guru Nanak, has roughly 25 million followers globally, most of them living in India’s western Punjab and Haryana states. Pakistan, the site of the religion’s founding and home to some of its holiest sites, also has a small population of tens of thousands of Sikhs. In February, tensions between nuclear-armed neighbours India and Pakistan spiked after a suicide attack in the disputed region of Kashmir killed at least 40 Indian security force personnel. India blamed the Pakistan-based Jaish-e-Muhammad armed group and the Pakistani government for carrying out the attack, conducting retaliatory airstrikes on Pakistani soil on February 26. A day later, Pakistan conducted strikes of its own, with both country’s fighter jets engaging in an aerial dogfight. At the height of hostilities, some of the pilgrims thought they would have to forego their trip this year. “I had initially thought that whatever happens, even if there is war, it will happen both here and there so I’ll go regardless,” said Ravinder Singh, 48, who runs a footwear store in the Indian city of Simla and was visiting Pakistan for the first time. Singh said it was important for him to perform the pilgrimage this year because he felt the compulsion of his faith. 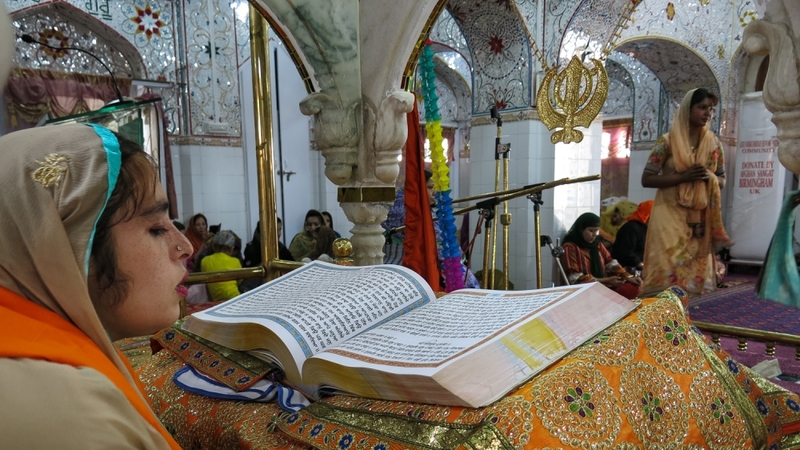 Sikhs believe that the Panja Sahib shrine is particularly sacred because it contains a large boulder that bears a handprint that they believe belongs to Guru Nanak. It is said that, after a dispute with a local Muslim saint over providing drinking water, Guru Nanak placed his hand upon the earth and a spring of water appeared. At this, the enraged Muslim saint threw a boulder from his hilltop shrine, which the Sikh saint stopped with his hand. The stream, to this day, runs through the centre of the gurdwara, and it forms a pool around a small alcove where the rock is visited by pilgrims. “When I saw and touched the stone, I felt like my faith had been renewed,” said Dilbagh Singh, 52, a farmer from the village of Sant Nagar, in India’s Haryana state. Inside the inner gurdwara, a woman in a teal shalwar kameez recites from the Guru Granth Sahib as devotees prostrate themselves before it. She sits within an ornate white shrine made of plaster and colourful glass set in intricate geometric designs. A crystal and glass chandelier hangs from the roof, also tiled with glass in symmetrical patterns. Inside the room, there is a hushed silence, as pilgrims read from holy texts or listen to the recitation. Some weary travellers get a few minutes of sleep, tired from multiple rail journeys and having to sleep on floors through much of the trip. Soon, a young man in a blue shalwar kurta and pink turban takes the dais, relieving the previous reader. Outside, the sound of devotional songs accompanied by tablas and harmoniums fills the air. The musicians sit in a separate hall, but their intricate harmonies cascade across the rest of the gurdwara, bathing it in sound. “It will be best if there is peace here between the two countries,” says Jagah Singh, 70, on his first pilgrimage to Pakistan following his retirement from the Indian army after 30 years’ service. It was not quite his first trip to Pakistan. During the war between India and Pakistan in 1971, he says he recalls eating lunch at a railway station in the Pakistani town of Shakargarh, after a major battle between the warring nations. Now, however, he says he believes that peace is the way forward for both countries. When he returns, he says he will tell his countrymen that Pakistan “is a great place, and we are all brothers”. 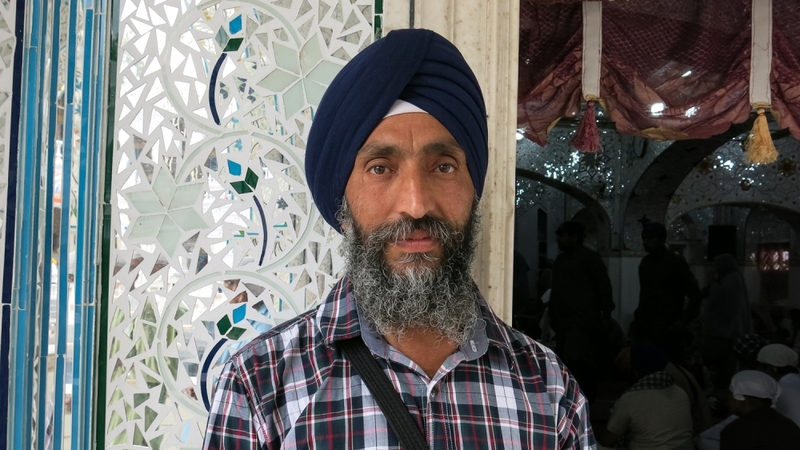 Siv Singh, 52, a fellow resident from Jagah Singh’s town of Nangal, echoes that sentiment, saying he looks forward to returning to the country soon through a visa-free corridor being established for Sikh pilgrims. In November, Pakistan and India agreed to create a visa-free corridor between the Sri Kartarpur Sahib gurdwara in Pakistan and the Indian town of Dera Baba Nanak, about six kilometres away. The shrine in Kartarpur is of particular importance in Sikhism, as it contains the grave of Guru Nanak, and it is where he spent the final years of his life, farming the fields and formalising what would become the Sikh religion. Technical talks on the Kartarpur corridor are currently the only platform on which Pakistan and India are engaging bilaterally. The latest technical talks on the issue are to be held on Tuesday at the Wagah/Attari border, according to Pakistan’s foreign office. The talks remain a point of contention in the current atmosphere, however, with India postponing the last round, drawing accusations from Pakistan of attempting to delay construction before the November deadline, which would be Guru Nanak’s 550th birth anniversary. Earlier this month, Pakistan’s foreign minister accused India of preparing to launch a military attack against Pakistan in April. India’s foreign ministry dismissed the accusations as “irresponsible and preposterous”. Still, fears remain high of any return to an escalation of hostilities between two countries that have fought three all-out wars and several limited military engagements since gaining independence from the British in 1947. Asked if possible hostilities would have any impact on future plans to visit shrines in Pakistan, Ravinder Singh paused before answering.